Stainless steel blade is replaceable and held in place by 2 stainless steal bolts and nuts. Edge is sharpened on both sides for cutting from multiple angles. Rounded tip offers resistance and keeps wrap from sliding without being cut. Rounded tip is non-sharpened to allow personnel to slide between leg and wrap without injury to livestock. The Wrap Buster blade has been heat treated through and through. A simple, quick sharpening of the cutting edge with a sharpening steel will restore the Wrap Buster blade to its original “Gone Before They Know It” performance. The aluminum handle is rust resistant. Molded rubber grip for comfort when cutting sraps off the livestock’s foot. The hole at the top enables the WRAP BUSTER to be hung almost anywhere. 18″ handle for parlor use on back feet. 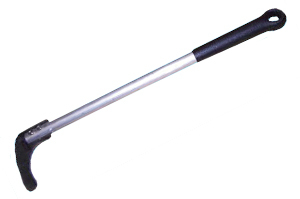 48″ handle for use in headlocks, free-stalls or parlors on front feet. Slide blade between livestock’s foot/leg and wrap. Pull blade back swiftly to cut and remove wrap. WARNING: Designed for livestock use only. Keep away from children. Cutting blade is very sharp. Improper use could cause injury. Do not put fingers in hanger ring. Keep away from eyes and face. Manufacturer & Distributor not liable for improper use.